Persistence pays off! 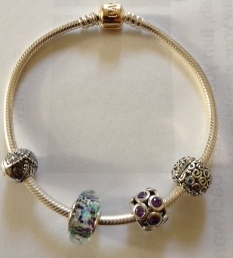 Today I am heading out to buy the next charm for my journey bracelet. So many of my friends have been instrumental in helping me overcome the setback I sustained this month. Through their support and belief in me, I have managed a 10.5 pound weight loss thus far. My sleep has improved, I actually sleep less and feel more rested. My mental clarity is far, far better. I’m so glad to have lost the mental fog. And Meg has a few things to say so stay tuned to her next post! If you don’t know much about Pandora bracelets (and I’m learning as I go along), a bracelet has 2 clips which center the initial charms. The clip on the left is a starfish and the one on the right with the swirls and tiny blue stones is called sea. Next to the starfish is my first charm: sea glass. To the right of it is the second charm with purple stones: whimsical lights. I’ve found I have expensive tastes, not a huge surprise to me. I’d rather have fewer, but nicer, things than just junk. Since this bracelet means far more than just some wrist bling, I don’t mind the investment. It’s an investment in myself, after all and I’m priceless. This entry was posted in challenges, journey, learning experiences, Weight loss, wellness. Bookmark the permalink. Great job, Beth! Quitting is not an option, as we well know. I’m proud of you for working through the tough spots, and I hope things are easier for a long time to come. 10.5 lbs. is FANTASTIC! Thanks, Jill. I so appreciate your support. Way to go! I am sensitive to this type of hard work, persistence and struggle. It sounds like it’s already paying off. It must feel great. Removing the brain fog makes you feel human and vital again. Working with apnea patients, I know this well. Enjoy your new found health, and keep the fight going! Thanks, Vicki. I appreciate your comments and the fact you’re reading my blog! This has been an epic battle for me throughout my adult life, one I’m determined to win.